One thing we can all agree on – small guitars rock! Sure, they may not be the loudest acoustics out there, or the easiest to play, but they are so useful – for everything from traveling the world to just having one nearby when inspiration strikes. A small guitar that proves popular time and again is the affordable JR1 from Yamaha. Today we’re taking a look at this budget choice and why it always pops up in our charts. 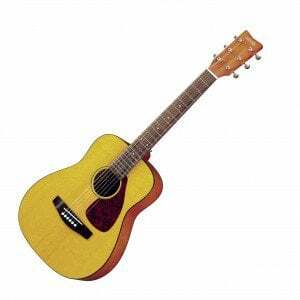 Yamaha kept things simple when designing the JR1, opting for their famous FG folk guitar shape with a reduced 3/4 size. This gives it a nice balance in terms of being big enough to play comfortably, but small enough to both keep around the house or travel with. With the 3/4 scale, it can get a little cramped for players with larger hands, but for most people – especially beginners and smaller players – it’s a great size. Balance was also in mind with the materials, as the JR1 features the classic pairing of spruce as the tonewood of choice on the top, with meranti making up the back and sides. Of course, on such an affordable guitar, these are both laminated. Overall, it’s a simple but sophisticated little acoustic, with the black body binding enhancing the elegance. The neck is standard – nothing special, but solid and comfortable to move around, with a nato build, satin finish and a rosewood fretboard with 20 frets. It all feels well built for a mass-produced model, although – like many budget acoustics – a string change and a good setup will breath extra life into it from the off. This is an area where most manufacturers try to reduce the costs, which is why many affordable guitars often come with shady hardware. However, the Yamaha JR1 offers decent components for the price. The body is fitted with a simple rosewood bridge, featuring a compensated synthetic bone saddle and nut. The same simplicity is applied to the tuners – there’s an average set of chrome open-geared tuning machines, which do the job. If you expect it to sound like a high-end Martin dreadnought you will, of course, be disappointed. Smaller acoustics traditionally have a weaker projection and lack a good low-end response – an inevitable trade-off for their compact size. Still, the shape and build quality of the JR1 delivers a pretty good tone, with a bit more punch than some standard concert style travel guitars. It’s a little boxy but the trebles are crisp and clean, while the mid-range is solid. Yes, it lacks a bit of bass, but for its intended uses it’s not bad at all! Those working on a tight budget who need a compact acoustic guitar for travel, or a myriad of other purposes, will find the JR1 from Yamaha to be a great solution. It’s well-made, offers a good tone and won’t ruin your bank account. After a string change and a decent setup, it’s hard to fault for the price. For more info about the Yamaha JR1,click here. For more best travel acoustic guitars, click here.